I read an article before the holidays about the NRA and how it may be losing its strangle hold on the message….. Governor Cuomo got a lot of credit for what, in reality, took an entire movement comprising hundreds of organizations. (For many reasons, business magazines tend to downplay the powerful role of social movements in economic shifts.) The reality is clear to those who have been following the Parkland students and movement groups like #NotOneMore and Everytown for Gun Safety: their strategies are working and the governor is a welcome ally. The National Rifle Association (NRA) said it is facing financial ruin because of a “blacklisting” campaign headed by New York Governor Andrew Cuomo, according to a lawsuit filed by the gun rights group. The NRA said it may no longer be able to produce its magazines, run its video streaming service or hold rallies because the state of New York has caused “irrecoverable loss and irreparable harm” to the organization. Again this is not about our rights or gun control…it is about unbridled political power…..especially any abuses of our trust….and to my thinking the NRA has violated all trust that I gave them in the past. Let it join the DoDo! I don’t disagree with people owning shotguns, revolvers and rifles used for hunting, but I am in favor of a ban on semi-automatic weapons with large clips or magazines. That would include most rifles and some handguns. Those are the guns which have been used in the mass shootings in schools and other places. I would favor a law banning sales of those guns manufactured after the date the law goes into affect. This is very good news. I too am a gun owner. I have a handgun for protection. Of course at one time handguns were the boogeyman guns–then came the AR 15’s and the like. I have never been in favor of a handgun ban, but these AR 15’s on the streets have never made sense to me. Perhaps we could even live with these guns if they were strictly and uniformly regulated. Sensible gun control laws will preserve our constitutional rights, our uniquely American way of life and save lives. From the perspective of a European-based ‘foreigner’, I am always saddened to read that people I respect so much (like you and Pam) are also such fervent supporters of owning personal firearms. For such a wonderfully scenic and ethnically diverse country, to see it being known for ‘gun-culture’ is just tragic. 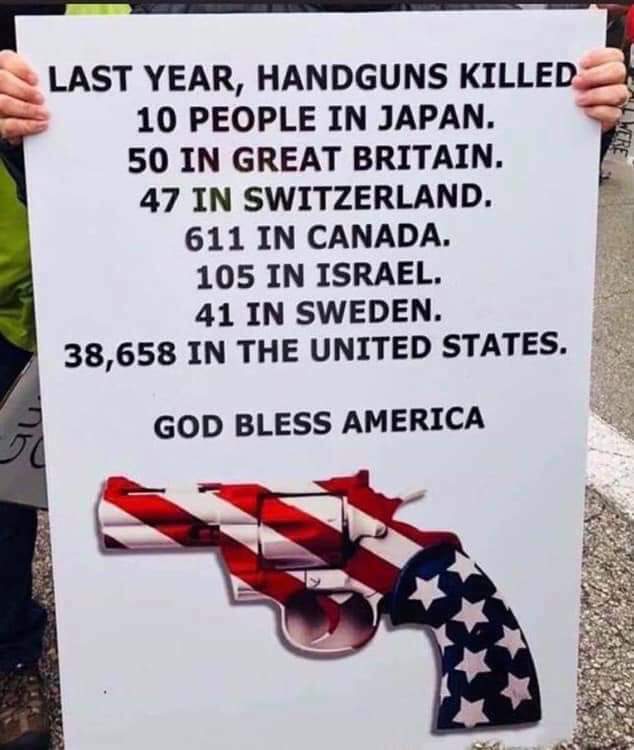 Until (which will be never) the American national obsession with owning firearms can be tackled, your country will never be free from its out of control murder rates, and increasing numbers of mass shootings. Your illustration says it all, chuq. I respect your perspective, Pete. And, of course, from a black and white point of view, you are right. But our nation was born out of strife and our ability to lay our hands on guns and fight. Guns are an appendage of our culture. If we sever that appendage we will probably bleed to death. That said, I envy and applaud our enlightened European friends anemic murder rates. Thanks, Pam. I can honesty understand the history behind it, and the fear that prompts people to need to feel ‘protected’ by owning a gun. Compared to the US, we live in a very safe place. But someone has to start somewhere, or it will sadly never stop. I am pro-gun, and pro second amendment. I have many guns, for hunting, home protection, for fun, and for “just in case”. I have several semi-automatic weapons. Many say that there is no use and no need for them, I disagree. Not everyone is in the situation I am in, and don’t need them in ALL the same ways I do. I live on a farm, we have cattle, and coyotes can eat cattle and calves, especially in packs. In one day I have killed over 6 coyotes. The most in one “session of shooting” was 3. If I wouldn’t have had a semi-automatic weapon, I wouldn’t have been able to do that, and that could’ve resulted in me losing cattle. I also have semi-automatic weapons for the “just in case” factor. If our government ever becomes so corrupt that we need to rise up, like we have many times in the past, it is going to be the people that do that. And if people were to ever come to our country, in kind of a “red dawn” scenario, we will need people like me. That is why I agree with semi-automatic weapons. Yes, things can go bad with them as well, but if someone is planning an act, gun control isn’t going to solve everything.